Want to buy an Elka Synthex? Try eBay. Bad news for anyone who was hoping to see the Elka Synthex polysynth going back into production: the crowdfunding campaign that was set up to revive it has failed to reach its funding target, so the reissue will no longer be happening. In a statement on the Elka Synthex Facebook page, the team behind the project said: "The Elka Synthex campaign on Indiegogo has now ended. We're saddened that we did not reach the funding target. "This unfortunately means that Elka Synthex will not be coming back after all. We thank everyone who contributed and supported us. "All contributions have been refunded. Contributors will receive these refunds in their Paypal account, or issuing credit card (within 5 days). If you have any further questions about the refund process please contact Indiegogo. "It would have been cool to Bring Elka Synthex back." 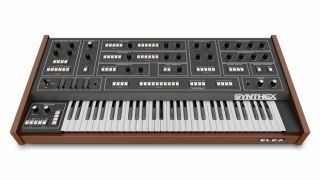 In hindsight, it was probably ambitious to hope that enough customers would be prepared to pledge more than $3,000 for something that hadn't even been shown as a prototype, but it would indeed have been cool to have the Synthex back. All may not be completely lost for fans of the synth, though, as it was rumoured last month that Mario Maggi, designer of the original instrument, may be working on a Synthex 2. We'll bring you more news on that as we get it.